TD is joining the party of other financial institutions and predicting a correction in Toronto's real estate market. So far we have IMF saying that Canada's real estate is overvalued by 10% to 15%, BMO suggesting a moderate correction in Toronto and Marc Carney from Bank of Canada saying that more housing adjustment is to come in next the few years. But what does BMO mean by "a moderate correction"? 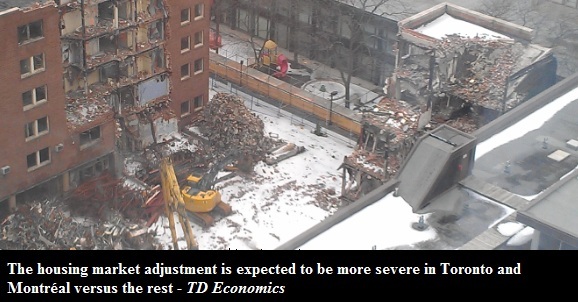 And what does TD mean by saying that the housing market adjustment in Toronto is going to be more severe? TD forecasts that Toronto average price will drop from $507,000 in 2013 to $494,800 in 2014. Well, that's hardly a correction and it doesn't look severely worse from their forecasts for other Canadian cities. There must be something TD is not telling us, but why should they tell us? If they told us that the market was substantially overvalued, less of us would buy houses, which means less of us would get TD mortgages, which means less profit for Toronto Dominion. Below are some images from the report.